Preheat the oven to 350F. Lightly grease a 24-cavity mini muffin pan with coconut oil. Add the maple syrup and room temperature coconut oil and mix until a large dough ball forms, pressing out any clumps of coconut oil. If you're mixing with a bowl and spoon (not a stand mixer), you may want to use your hands at the end to bring to dough fully together and make sure there aren't any lumps.Divide the dough between the 24 mini muffin cavities and press up the sides. Bake for 9-11 minutes, or until golden brown around the edges. Let cool completely before using a toothpick or knife to pop the cups out of the muffin tin.In a stand mixer fitted with a whisk attachment (or a hand mixer), beat the chilled coconut cream with the maple syrup and vanilla extract until smooth and creamy, 1-2 minutes. 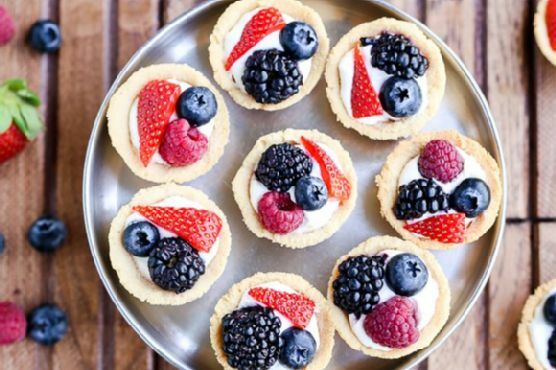 Add a scoop of whipped coconut cream to each cooled shortbread cup and top with fresh berries.